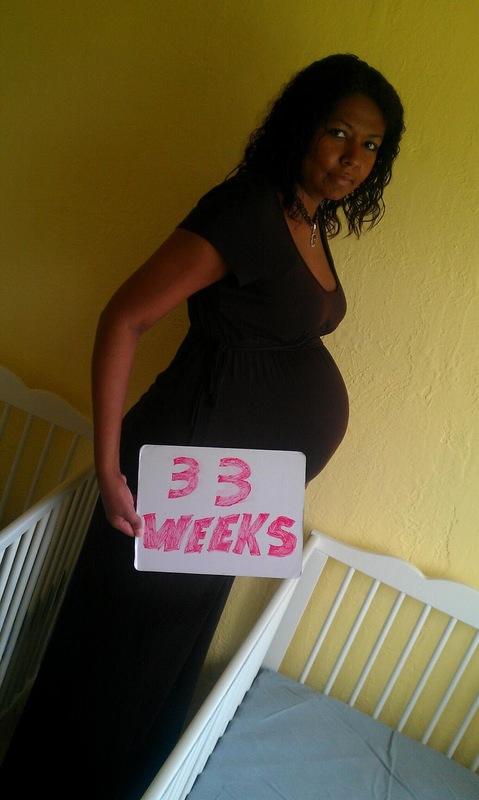 Wow, I can't believe we are at 33 weeks already. It's weird how time goes by so quickly yet so slowly at the same time. Four more weeks until full term. This week the Twinjas skeletons are hardening. This week they may be going through a growth spurt. That could explain why all I want to do is eat and sleep. The amniotic fluid has maxed out this week so I have more babies than fluid. This explains why I am constantly feeling pushes and nudges. I had a doctors appointment yesterday and everything looked good. Babies had strong heartbeats and my cervix was still closed. Baby girl is sitting really low so the doctor warned me that I could start seeing on myself. Oh joy. I have been doing my kegals so hopefully it won't be an issue. The doctor says that twins have a mind of their own so they can decide to arrive at anytime. I like the date 8/5/13. I've started having random braxton hicks contractions. They have been pretty mild. I still want to labor without pain meds but since I haven't been able to complete my hynobabies I'm not sure if I will be able too. I need to research some alternatives. Maternity Clothes? I left the house this week so I was able to wear one of my dresses. Stretch Marks? A few on my hips. Stomach is still clear though. Sleep? I miss sleep. Some nights I just cry. Looking forward to? Making it to week 34. Finishing the nursery.